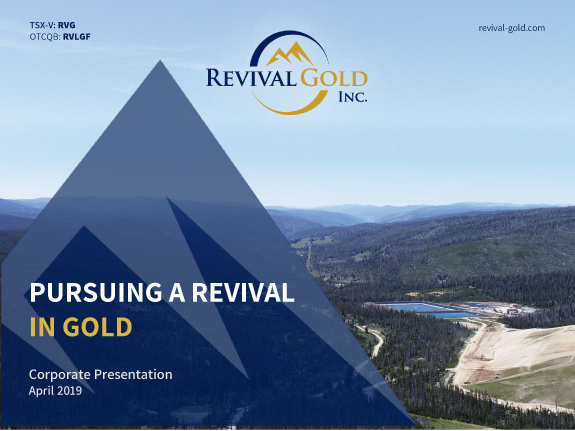 Revival Gold Intersects 0.94 g/t Gold Over 54 Meters At Arnett And 20.1 g/t Gold Over 2.1 Meters At Beartrack - Revival Gold Inc.
Toronto, ON – January 14th, 2019 – Revival Gold Inc. (TSXV: RVG, OTCQB: RVLGF) (“Revival Gold” or the “Company”), a growth-focused gold exploration and development company, announces results from the final four holes of the Company’s 2018 core drill programs at the Arnett (“Arnett”) and adjacent Beartrack (“Beartrack”) gold projects located in Lemhi County, Idaho. BT18-222D in the South Pit area at Beartrack intersected 1.79 g/t Au over 16.3 meters1. 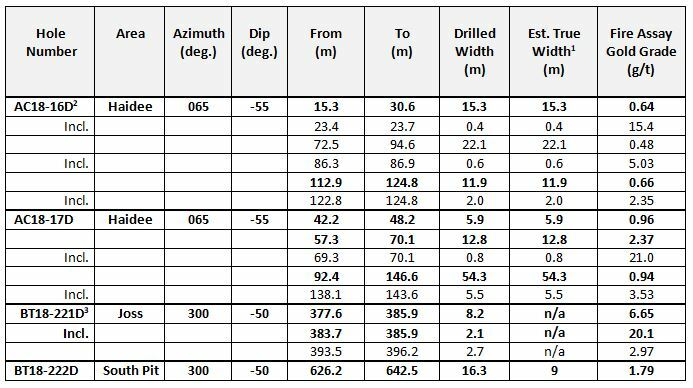 1 Drilled width; estimates of true width and down-hole positions of mineralization are presented in the table below. “AC18-16D and AC18-17D, the last and most northerly two holes drilled along strike in the Haidee area during the 2018 program at Arnett, intersected significant widths of near surface oxide gold mineralization”, said Hugh Agro, President & CEO. “At Beartrack, in the Joss area, BT18-221D cut some of the best gold grades encountered on the project to-date. Together, these results underscore the exciting potential and broad scope for follow-up exploration activity we see for Beartrack-Arnett in 2019”. True width is estimates in the Haidee area estimated to be approximately equivalent to drilled width. 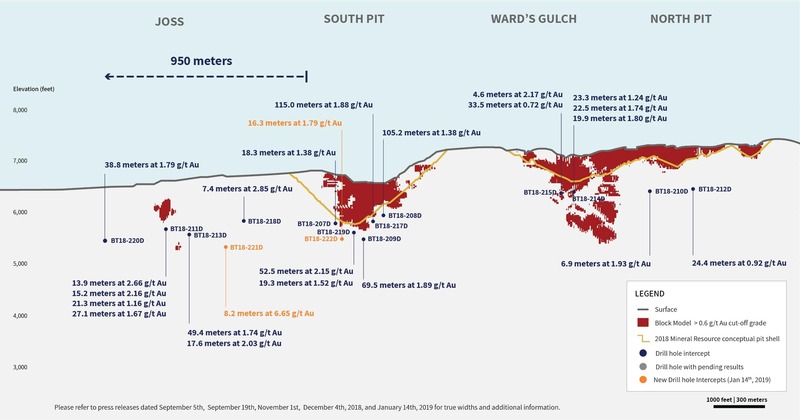 True width estimates in the South Pit and Ward’s Gulch areas, as well as the area between the South Pit and Joss, are based on a vertically dipping mineral zone. True width in the Joss area is unknown (n/a). Drill holes typically steepen during drilling so the inclination of the drill hole at depth may not be the same as the inclination at the collar. Numbers may not add up due to rounding. Recovery for the for the interval 122.8 m to 124.6 meters was 40%. Recoveries for the intervals 393.5 meters to 395.0 meters and 395.9 meters to 396.2 meters were 30% and 20% respectively. The intervals immediately below the upper interval and immediately above the lower interval had recoveries of 0%. Mineralization in the Haidee area at Arnett remains open along strike to the south and north, as well as down dip to the west. Mineralization often occurs as visible native gold within oxidized pyrite which results in highly variable assay values. This nugget effect is present, even when larger samples sizes (two assay-tonne) are used. For this reason, Revival Gold intends to follow-up its conventional two assay-tonne fire assays at Haidee with metallic screen assays of larger-than-normal pulps. Figure 1 illustrates a plan view at Arnett showing the mineralized envelope in the Haidee area, the eleven core holes drilled by Meridian Gold Inc. in 1997 and the six core holes completed by Revival Gold in 2018. Mineralization at Beartrack remains open to the south of Joss, north along strike between the South Pit and Ward’s Gulch area and into the North Pit. 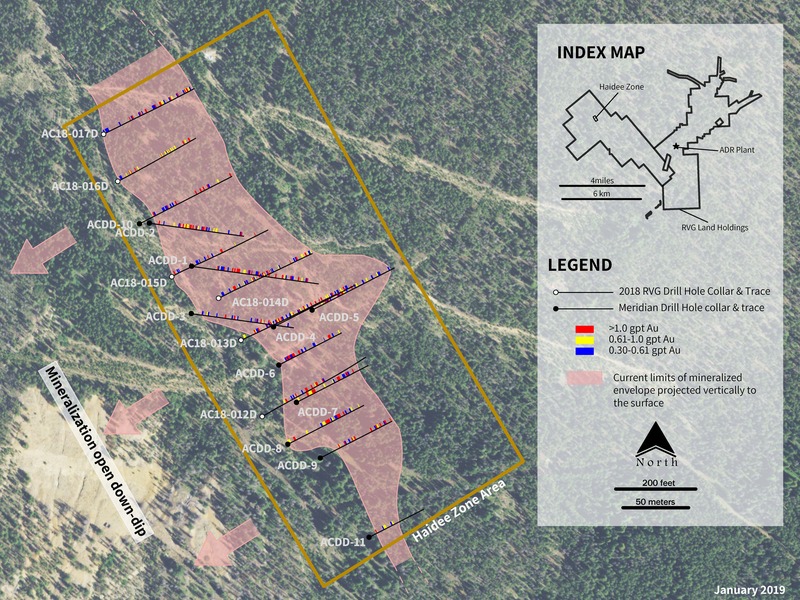 Figure 2 illustrates an up-to-date north-west facing long-section view at Beartrack showing the current Beartrack mineral resource block model (see “Mineral Resource Estimate, Beartrack Property, Lemhi County, Idaho, United States”, dated July 12th, 2018, for further details) as well as the location and results of all fifteen drill holes completed at Beartrack in 2018. A follow-up phase of drilling and metallurgical test work for Beartrack-Arnett is being planned. Revival Gold expects to initiate preparatory work on an updated resource estimate later this year. Quality Assurance/Quality Control consists of the regular insertion of duplicates, blanks and certified reference standards into the sample stream. Check samples will be submitted to an umpire laboratory at the end of the drilling program. Sample results are analyzed immediately upon receipt and all discrepancies are investigated. Samples are submitted to the ALS Minerals sample preparation facility in Elko, Nevada. Gold analyses are performed at the ALS Minerals laboratory in Reno, Nevada and multi-element geochemical analyses are completed at the ALS Minerals laboratory in Vancouver, British Columbia. ALS Minerals is an ISO 17025:2005 accredited lab. Gold assays for the Beartrack Project are determined by Fire Assay and AAS on a 30-gram nominal sample weight (Au-AA25). For shallow holes targeting leachable mineralization, gold is also determined by cyanide leach with an AAS finish on a nominal 30-gram sample weight (Au-AA13). Multi element geochemical analyses are completed on selected drill holes using the ME-MS 61 method. Sample preparation for the Beartrack Project is using the Prep 31 method, which involves the preparation of a 250-gram pulp. Gold assays for the Arnett Project are determined by Fire Assay and AAS on a 50-gram nominal sample weight (Au-AA24). For some of the Arnett holes, gold is also determined by cyanide leach with an AAS finish on a nominal 30-gram sample weight (Au-AA13). Multi element geochemical analyses are completed on selected drill holes using the ME-MS 61 method. Sample preparation for the Arnett Project is using the Prep 31B method, which involves the preparation of a 1,000-gram pulp. Steven T. Priesmeyer, C.P.G., Vice President Exploration, Revival Gold Inc., is the Company’s designated Qualified Person for this news release within the meaning of National Instrument 43-101 Standards of Disclosure for Mineral Projects and has reviewed and approved its scientific and technical content. Revival Gold has approximately 42 million shares outstanding and had a working capital balance of $2.3 million as at September 30th, 2018. Additional disclosure of the Company’s financial statements, technical reports, material change reports, news releases and other information can be obtained at www.revival-gold.com or on SEDAR at www.sedar.com. This News Release includes certain “forward-looking statements” which are not comprised of historical facts. Forward-looking statements include estimates and statements that describe the Company’s future plans, objectives or goals, including words to the effect that the Company or management expects a stated condition or result to occur. Forward-looking statements may be identified by such terms as “believes”, “anticipates”, “expects”, “estimates”, “may”, “could”, “would”, “will”, or “plan”. Since forward-looking statements are based on assumptions and address future events and conditions, by their very nature they involve inherent risks and uncertainties. Although these statements are based on information currently available to the Company, the Company provides no assurance that actual results will meet management’s expectations. Risks, uncertainties and other factors involved with forward-looking information could cause actual events, results, performance, prospects and opportunities to differ materially from those expressed or implied by such forward-looking information. Forward looking information in this news release includes, but is not limited to, the Company’s objectives, goals or future plans, statements, exploration results, potential mineralization, the estimation of mineral resources, exploration and mine development plans, timing of the commencement of operations and estimates of market conditions. Factors that could cause actual results to differ materially from such forward-looking information include, but are not limited to failure to identify mineral resources, failure to convert estimated mineral resources to reserves, the inability to complete a feasibility study which recommends a production decision, the preliminary nature of metallurgical test results, delays in obtaining or failures to obtain required governmental, environmental or other project approvals, political risks, uncertainties relating to the availability and costs of financing needed in the future, changes in equity markets, inflation, changes in exchange rates, fluctuations in commodity prices, delays in the development of projects, capital, operating and reclamation costs varying significantly from estimates and the other risks involved in the mineral exploration and development industry, and those risks set out in the Company’s public documents filed on SEDAR. Although the Company believes that the assumptions and factors used in preparing the forward-looking information in this news release are reasonable, undue reliance should not be placed on such information, which only applies as of the date of this news release, and no assurance can be given that such events will occur in the disclosed time frames or at all. The Company disclaims any intention or obligation to update or revise any forward-looking information, whether as a result of new information, future events or otherwise, other than as required by law.